The stunning one level home features an open and bright floor plan with living and dining rooms, kitchen with breakfast nook, a large family room with fireplace. The view from all living areas is to the backyard with a salt water pool which is fenced, a Palapa, covered patio and a building that could function as a "She Shed", a "Man Cave", Play House, or storage. 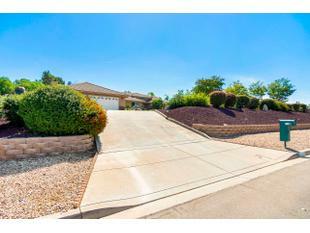 The very usable half acre lot is low maintenance. The view of the surrounding hills accentuates the beauty and tranquility of the property. Don't miss the virtual tour link for more photos! All the bedrooms have ceiling fans and have direct access to a bathroom for privacy. The kitchen is open and bright with plenty of storage and features a Keurig coffee maker connected to the water line of the refrigerator, no daily refilling! Both refrigerators, a safe and washer and dryer convey with the property. Solar system for the house is leased; solar system for the pool is owned and conveys. Lots of storage including attic storage above garage with pull down steps for access. Easy access to shopping and freeway access. Other Fee is State of CA for Fire Mitigation.